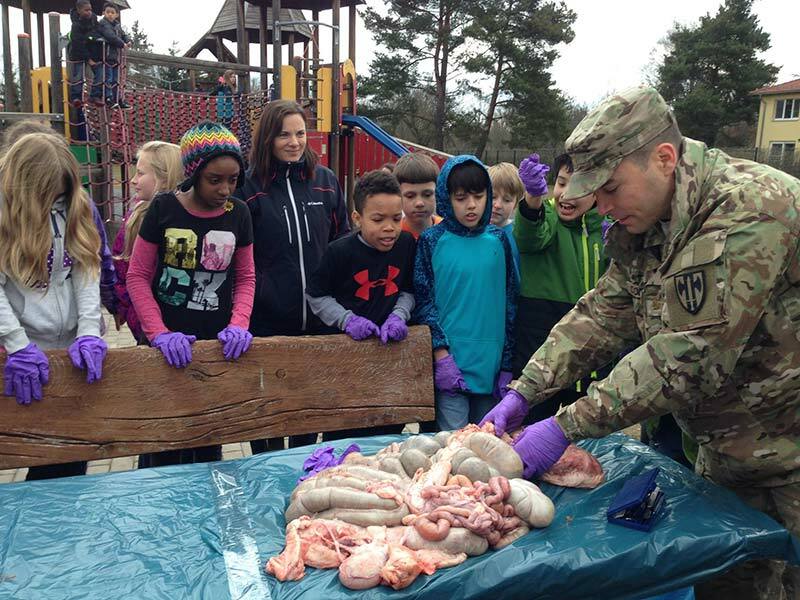 Grafenwoehr Army Health Clinic’s Maj. Robert Cornfeld dissects a pig with fifth-graders from Grafenwoehr Elementary School. Photo by Diane Rocha. GRAFENWOEHR, Germany — Grafenwoehr Army Health Clinic’s Maj. Robert Cornfeld visited Grafenwoehr Elementary School March 15 to dissect a pig with Dr. Bill Hunter’s and Ms. Terri Sobey’s 5th grade classes. This is not the first time Dr. Cornfeld has come to Grafenwoehr Elementary School to teach students the anatomy of animals. He came several weeks earlier and demonstrated the parts of a cow’s heart. Each group of students was given a heart to dissect. This was a Career Awareness activity and led to the study of the human body. “During a Career Awareness activity, we focus on careers that students may choose as a profession. We try to have individuals from the community come into the classroom and give us a glimpse of their field of expertise,” Dr. Hunter said. Mrs. Silke Velez, a volunteer mom, kindly picked up the pig organs from a local butcher the morning of the dissection. Since the organs were so fresh the odor was very strong and we had to have the lesson outside. Dr. Cornfeld pointed out the various parts of the digestive system. As he cute open the large intestine some students squeamishly ran away because of the appalling odor. “The cow heart was good, but the Intestines! I couldn’t handle it.” said Nick O’Keefe, a fifth grader in Dr. Hunter’s class. About half the class enjoyed the activity and the other half was a bit queasy. “It was an awesome and a great experience,” said fifth-grader Breanna Tate. Like it or hate it, you can’t argue that this lesson was thrilling. The fifth-graders at Grafenwoehr Elementary School are thankful to Dr. Cornfeld, Mrs. Velez, and Dr. Hunter for organizing this activity.